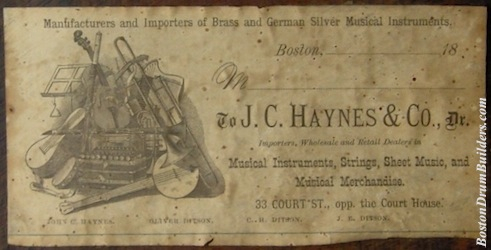 J. C. Haynes & Company served as the musical instrument manufacturing division of Boston's Oliver Ditson Company for the entirety of the Haynes Company's existence from 1861 through the end of 1903. 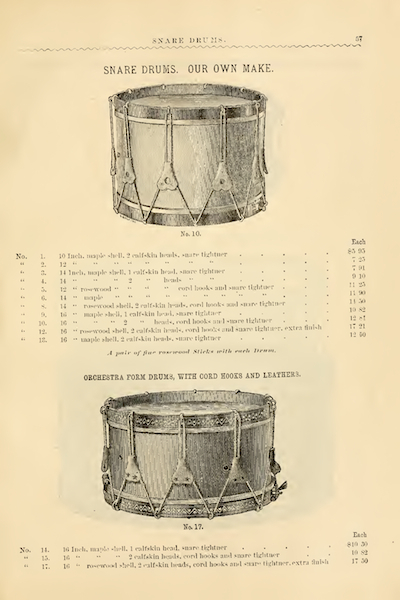 During that time Haynes produced many styles of drums in a wide variety of sizes including those of smaller dimensions such as this dainty example dated September 29, 1880. Measuring 8" deep by 14" across this drum was likely intended for a younger drummer, a child even, but is otherwise not so different from any other 1880s Haynes rope tension model. The workmanship is sound but perhaps short on fine craftsmanship. Haynes' drums were not generally given the same level of care as wind and brass instruments, much less bowed string instruments - not that this was so uncommon for a large instrument maker of the late 19th century. A company devoted only to drums and percussion was a novel concept which had yet to arrive in Boston as of the 1880s. Affixed inside the shell is a wonderful dated makers label. The same style of label is known to have been used on many other Haynes drums from the early 1880s, some of which are dated and some of which are not. Dated labels such as this one help to place undated examples to roughly the same era of manufacture. 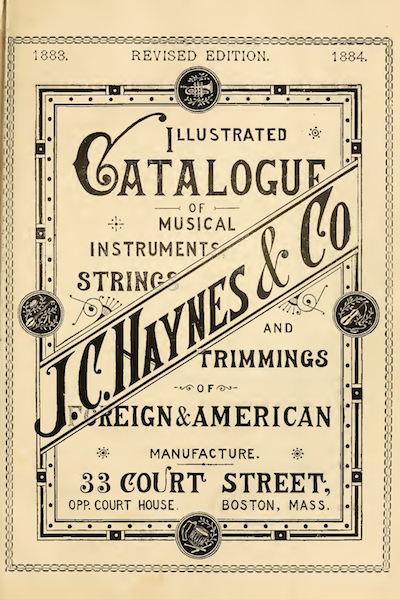 The 1883 J. C. Haynes & Co. Catalog lists a vast selection of musical instruments ranging from accordions, banjos, and bassoons, to violas, xylophones, and zithers, and of course drums. 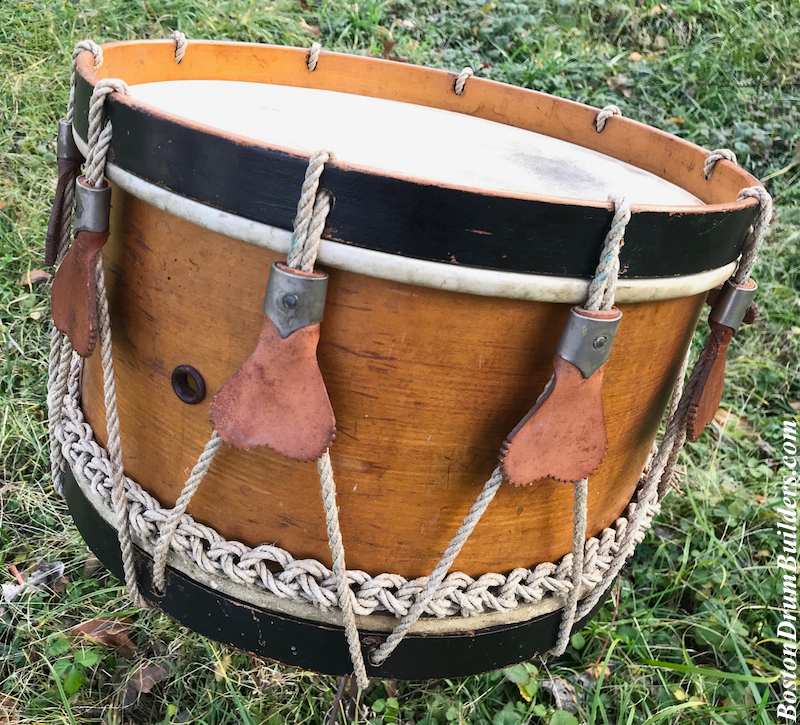 Included are rope tension wooden shell snare drums available in rosewood or maple, and 'Prussian' style rod tension drums offered with maple, rosewood, nickel, or brass shells. A 14 inch, maple shell drum with 2 calfskin heads and snare tightener, referenced as model No. 4, was priced at $9.10. And if a fourteen inch drum was still too large, 12" and even 10" diameter models were also available. 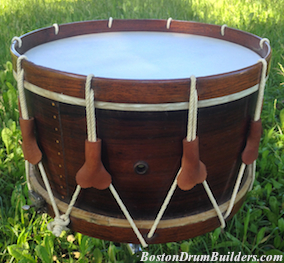 Do you have a drum made by Boston's J. C. Haynes & Company? I would love to hear about it! Drop Lee a note at lee@vinson.net. 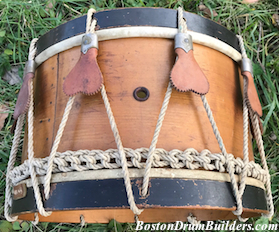 And for more on Boston's early 20th century drum makers, please visit BostonDrumBuilders.com.